· Natural Remedies – Weeds, Head Lice Foot Fungus, Insect Bites and more. Howard Garrett, “The Dirt Doctor” is teaming up with a fabulous list of speakers to present and educate how to live and garden in a healthier environment while saving money. Howard is an author, talk show host, landscape architect and arborist. He is known for his expert advice and information on natural organic gardening, landscaping, pet health, pest control and natural living. Organic Club of America membership entitles you to seminars, answers from Howard on a priority basis, special offers, Dirt Doctor Radio Webcam, seeds from the Dirt Doctor’s garden, and a full year of DIRT articles. Join or Renew to attend this exceptional event. Prize drawings throughout the event for: Mosquito Control System, Rehoboth Ranch Meats, Howard Garrett Books, Scram Products, Crazy Water, STIHL, Dr. Ohhira’s Products, Haint Blue Paint, Seeds, Gardening Products and so much more. *Allen Public Library, 300 N. Allen Drive - Allen, TX 75013. RSVP will be sent to Members soon. 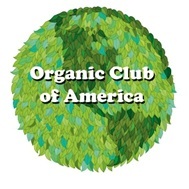 Join or Renew Organic Club of America Membership. Or call 866-444-3478.